or all the latest updates & information. Each student-athlete must have competed in at least four (4) meets during the D-I Northern Region's regular-season dual-meet schedule and have met the region's minimum qualifying time standard (see above) for a particular event to be eligible to compete in this meet. Division 1: competitors qualify for the finals’ session by placing in the top 16 of their respective event from the trials’ session contested the previous day. The top eight athletes will compete in the championship finals. The remaining eight will compete in the consolation finals. Two alternates for each event will be selected from the 17th and 18th place times from the trials’ session. In the event that an athlete cannot compete during the finals, the next athlete, by time, will advance into that place (and so on up the ladder) and an alternate will be used in the consolation heat. Division I: The top three (3) individual finishers and the top three (3) relay teams per event advance to the 2017 NIAA Division I Nevada State High School Swimming and Diving Championships. High School meets are dual meets which are 2 teams competing against each other. Additional teams may be swimming at the same time and in the same heats, but may not be competing against the same teams. For example, 4 teams could be at one meet, but 2 sets of teams are competing against each other even though other teams' swimmers may be in the same heats and events. This sounds confusing, but the officials have it all figured out! Dual meets usually last around 3 hours and have these events in the same event order alternating girls then boys: 200 Med Relay , 200 Free, 200 IM, 50 Free, 100 Fly, 100 Free, 500 Free, 200 Free Relay. 100 Back, 100 Breast and ends with the 400 Free Relay. Family/Parents/Spectators are asked to be timers for these meets. In addition to having a great front row seat, volunteers get to show their support for their athletes and meet people from the other teams. Training is available, no experience needed. These meets don't happen without volunteers! AND the "Home" team could suffer a forfeit if insufficient number of timers volunteer so PLEASE show up at least 15 minutes before the meet is scheduled to start and help out! *If you arrive late to the meet, please don't hesitate to relieve the timers or snack bar helpers that began at the start of the meet. For parents of club swimmers you will see a few differences in High School Swimming. First, High School Swimming uses different rules. The rule book is from The National Federation of State High School Associations. The first priority in High School Swimming is sportsmanship and participation. Swimmers can be disqualified for wearing jewelry as well as stroke violations. Swim Meets use a dual meet format similar to college swimming. Many of our meets are double duals where 4 teams swim together but it is scored as 2 meets. The first and second place swimmers in a heat may not be swimming against each other and both could get 1st place for their teams. This year there will be an Aqua 5 meet which is a Pentathlon and League, Regional, & State Championships. The time listed on The Meet Schedule is the start of the warm-up session; competition should start 45 minutes after that. The meet can take about 2.5 hours or longer. You may want to bring a folding chair. Like all High School sports there are officials that run the meets. In charge is a Head Meet Referee who has a Starter and Judges working with him/her. Also, there is a Clerk of Course and staff who organize the meet entries and results. During swim meets many volunteers are needed as lane timers. Lane timers run stop watches and record the times for the swimmers. Parent’s participation is critical for the success of our swim meets. Please volunteer if asked. The "Home" team could suffer a forfeit if insufficient number of timers volunteer. Swim Meet Etiquette or Quiet for the Start! The swim meet officials are there to provide the best possible conditions for each swimmer. Therefore, we ask you as a spectator to help us achieve that goal. During the starts, while the swimmers are on the blocks, there must be absolute quiet, So that the swimmers may have a fair start. Once the swimmers are in the water, please root them on. Artificial Noise Makers are not allowed in the natatorium during the swim meet. Please no flash photography at the start of the race. Flash photography may distract the swimmers or the timers and create the possibility of a false start, and errors in the times for the swimmers. Also, no flash photography if the swimmers are between the backstroke flags and the wall. 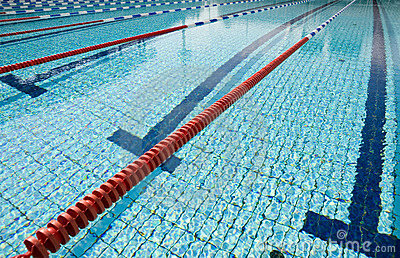 Flashes have caused swimmers to misjudge their turns, causing them to be disqualified or worst become injured. Please follow instructions given by the meet marshals and deck officials. There is always a possibility of swimmers becoming injured during a swim meet. If this occurs the Meet Referee or Life Guards may suspend the meet until the swimmer is safely removed from the pool deck. Sometimes Emergency Personnel will have to assist, please follow instructions of officials and stay clear. Our swim meets are at venues off school campus. We have had the unfortunate incidents of theft occurring during swim meets. Please do not bring valuables. If a theft occurs it will be handled by the pool guards and local police.